Next Generation iPhone Parts Uncovered? The new iPhone release is near! REPENT and prepare your DOLLARS! And, in the meantime, take a look at the inevitable leaked photos of parts already arriving to the Chinese part resellers. Some of them are labeled N94, suggesting an evolution from the original iPhone 4 (N90) and Verizon's iPhone 4 (N92). Would this be the fabled cheap iPhone 4 that would complement an all-new, all-amazing, all-magical iPhone 5 with built-in lasers, teleporting unit and burger synthesizer? Perhaps. 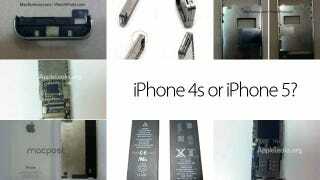 Would Apple release an iPhone 4s and get done with it? Maybe. Reuters Says Cheap-O 8 GB iPhone 4 Arriving "Within Weeks"